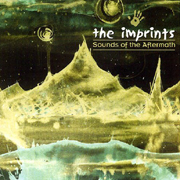 Produced by Pete Droge, Portland, Oregon pop-rock outfit The Imprints, fronted by ex. Baseboard Heater Rob Stroup, deliver a pretty straight-ahead record with Sounds of Aftermath. Well produced and well written, the songs may not jump out and grab you. But there are enough pop hooks and warm melodies to grow on you, so after giving this record a few chances, you'll start to realize the value the slow burning "Chemical Ambition", the mid-tempo, late-night pop of "Utah Zen", and the roots-rock-infused "Long List of No's". Other notables include the acoustic "Reckless" and the bouncy rocker "Tried and True", all of which make The Imprints debut a noteworthy pop album that shows this band may have a lot to offer, they just need to take a few more chances. I'll give it a B-.